Below you can view all the homes for sale in the Grogans Bluff subdivision located in Sandy Springs Georgia. 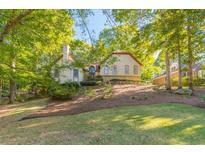 Listings in Grogans Bluff are updated daily from data we receive from the Atlanta multiple listing service. To learn more about any of these homes or to receive custom notifications when a new property is listed for sale in Grogans Bluff, give us a call at 404-998-4017. Full Finished Terrace Level -Fabulous Bar/Kitchen & In-Law Suite.Flat, Fenced Back Yard, Irrigation System, Central Vacuum-Front & Rear Stairs.This Home Is In Pristine Condition And Located On A Cul De Sac Near The Swim/Tennis Club Area And Is A Pleasure To Show. MLS#6529096. Harry Norman Realtors. New Lights, Led Cans, Bed/Bath/Rec Room/Gym In Basement. New Landscaping W/ Irrigation. MLS#6100063. Harry Norman Realtors. Multiple Decks Adjacent To Large Fenced Yard W/ Gate Access To Neighborhood Pool! Warm, Inviting Special Home. MLS#6090080. Harry Norman Realtors.